Mary and Martha were two sisters who were very unlike, but each was the compliment of the other and both were the friends of Jesus. They opened their home to Jesus, both helping to make their home in Bethany a restful place to which He could come from the murderous plottings of the priests and Pharisees. Martha was probably the elder of the two and she was a vigorous, bustling homemaker. From the narrative found in the Luke 10, it is obvious that Martha was over-careful about a multitude of unimportant details of the household. She was undoubtedly proud of her perfectly ordered home, but she had by almost become a slave to her house. Mary, on the other hand, appears to have more of a hunger for spiritual things. When Christ came to their home she took the opportunity, not to entertain Him, but to learn from Him. While Martha was angry at Mary for leaving all the work to her during Jesus’ visit, Jesus commended Mary and told Martha that she was unnecessarily burdening herself with over-carefulness and much serving. Jesus did honor Martha’s zeal and she shared equally in Jesus’ affection. 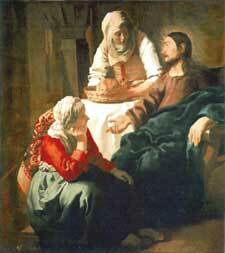 We meet Martha and Mary again in the Gospel of John, chapter 11, when bereavement has come to the family. Their brother, Lazarus, the beloved friend of Jesus, has died. The girls had sent word to Jesus of his illness, but by the time he arrives in Bethany, Lazarus is dead. Martha is the first to meet Him and hear the wonderful word of comfort, “I am the Resurrection and the Life.” Their brother is restored to them, the broken circle being made whole. Shortly before the death of Christ, we find Him again in Bethany (John 12). He is in the house of Simon the leper, where a banquet is being held in His honor. Martha is found serving, once again, but this time with a different attitude. She willingly serves at the table, lovingly ministering to the physical comfort of the guest, without resentment. Mary, too is here, and she brings in an alabaster box of ointment and anoints the head and feet of Jesus in a manner fit for royalty. Thus the two sisters, each in their own way, show their devotion to Christ.